We received such great feedback from both our ’69 classmates and the ’19s about our first 1969/2019 Trivia Nights that we decided to make it an annual Class Connections event! It is time for Number Three. We’re reaching out to encourage you and your ’69 buddies to participate in this year’s Trivia Night on Saturday, April th (see attached flyers). 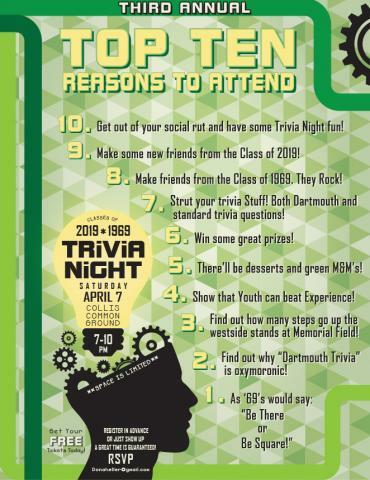 Rick Willets and Paul Tuhus have been hard at work concocting what promises to be another great set of creative, clever, and interesting questions (on both general and Dartmouth trivia) to challenge and amuse both young and old. Join us in Hanover for a fun and interesting evening, starting with a 5:00 P.M. dinner (self-pay) at Molly’s with your classmates. 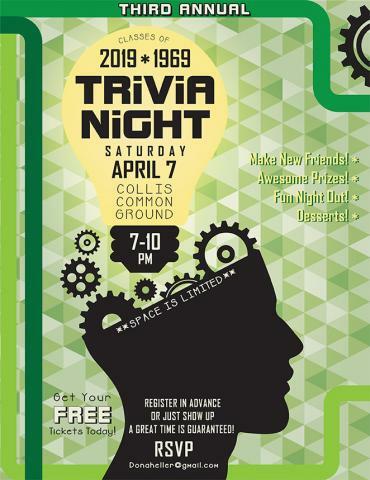 Then on to Trivia Night in Collis Common Ground (starting at 7:00 P.M.), where you can choose to play trivia at tables with the ’19s or to help Norman Jacobs score the question sheets while observing the festivities. Either way, you get green M & Ms! If you have questions or are interested in participating, email Dona Heller . Permalink Submitted by David L. Prentice on Sat, 2018-03-17 11:38. All fixed; is there no way to delete my whole comment now? Permalink Submitted by PeterElias on Sat, 2018-03-17 14:10. I have the forum configured so that only an admin can delete comments. Users can edit their own comments. The problem with letting users delete their own comments is that it breaks the thread if there are replies to a comment a user deletes.